Humanitarian operations in conflict zones such as Afghanistan are blighted by deadly improvised explosive devices (IEDs), an international affairs NGO says. The crisis is heightened by increasingly militarized and politicized international aid programs. In a report published on Tuesday, British global affairs NGO Chatham House said IEDs pose a mounting threat to humanitarian outfits operating in war-torn states. 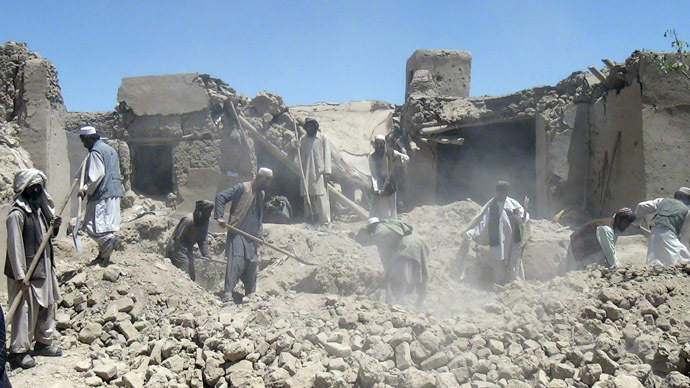 The research, titled ‘The Impact of IEDs on the Humanitarian Space in Afghanistan’, examines the way in which these deadly weapons impact upon humanitarian programs conducting work in conflict zones. Its authors argue the use of IEDs highlight a more fundamental crisis facing the humanitarian sector. It summarizes this crisis as dwindling neutrality and impartiality stemming from the increased militarization and politicization of humanitarian aid. Because IEDs generally cause particles to be blasted over a wide area, they carry a greater risk of harm than more conventional small arms fire. “This risk of being accidentally or indirectly affected means that IEDs create uncertainty for humanitarian operations,” the report says. Explosive weapons, and IEDs in particular, are a major cause of civilian deaths in Afghanistan the Occupied Palestinian Territories, Libya, Iraq, Syria, Ukraine and elsewhere. In the longer term, IEDs also destroy housing, water and sanitation systems, hospitals and other vital forms of infrastructure. The research examined cases where humanitarian groups were deliberately targeted by IEDs, and situations where they were caught in crossfire. It found protective strategies such as the deployment of armored cars and the building of “blast walls” make NGOs look militarized, thereby increasing their chances of attack. Chatham House’s research said fortressed NGOs may offer security in cordoned off compounds, but the separation of humanitarian workers from local civilians damages their reputations. “Attempts to operate using remote management techniques risk shifting the danger onto local staff and are impossible for activities such as advocacy,” the report said. While armed security and protective body armor may preserve safety against the threat of small arms, they are much less effective against IEDs, it added. IEDs are particularly indiscriminate weapons. Their danger has long been reflected in media coverage associated with global terrorism. According to Chatham House, the well-documented destructive impact of these weapons creates such insecurity and fear in humanitarian workers that oftentimes they flee warzones and their projects collapse. Because strategically-positioned devices can deter the delivery of vital aid for weeks and months on end, NGOs also risk being manipulated in conflicts, according to the report. Related costs are high and include staff fatalities and the traumatic impact such deaths can have on coworkers. Other detrimental effects include frayed community relations and costly post trauma care NGOs must provide their staff. Chatham House’s report follows the release of a United Nations policy document calling for urgent action to curb the use of explosive weapons in populated conflict zones. The document, published by the United Nations Office for the Co-ordination of Humanitarian Affairs (UNOCHA) on Monday, draws heavily upon research conducted by British think tank Action on Armed Violence (AOAV). In particular, it highlighted the extent to which these explosive weapons cause civilian fatalities and injuries in war-torn regions. The UN report also emphasized severe long-term humanitarian impacts associated with these arsenals, particularly increased levels of displacement, the destruction of countless homes, hospitals and other vital forms of infrastructure. Damaging long term secondary effects of such explosive violence can also often push vulnerable women into poverty and prostitution.